York is a wonderful maze of winding streets and hidden snickleways. Those who take the time to look above modern shop frontages will see an incredible array of historic architecture, where Roman soldiers, Elizabethan merchants and Victorian industrialists vie for your attention. The remarkable survival of the ancient fabric of York does, however, make finding spaces for archaeological investigation rather tricky! The All Saints excavation, nestled in an impressive enclave of medieval buildings. Thankfully, this has never stopped the Archaeology Live! team from finding amazing sites to host our training excavations. The All Saints, North Street dig is one of the most significant excavations on the south-western bank of the River Ouse in recent memory and the 2015 season has seen the better part of two hundred people getting involved! Over the last eleven weeks, the site had yielded many of its secrets and the team had made some remarkable discoveries. With just five days of the 2015 season left, we were keen to go out on a high! Virginia carefully revealing the decayed outline of a coffin. Over weeks 10 and 11 a 19th century burial in the centre of the site had become something of a conundrum. While one side of a timber coffin with decorative brass fittings was clearly visible, its counterpart was proving very difficult to find. The task of finishing this challenging feature fell to Virginia who, after five seasons of Archaeology Live!, is very handy with a trowel! While carefully excavating the backfill of the grave, Virginia unearthed a remarkable artefact! The object is made of copper alloy and is in excellent condition. With a hook at one end and a decorative head at the other, the artefact is similar in appearance to a modern crochet hook and appears to be a crafting tool. Virginia and her copper alloy crafting tool. Specialist analysis will hopefully give us a date for the object, although we already know that it is at least 161 years old! The finds that we have unearthed in our first two years at All Saints are providing a wonderful insight into the kind of tasks that filled the days of the area’s former inhabitants. With finds from the Viking period onwards associated with crafting, it is clear that the making and mending of fabrics was part of daily life. 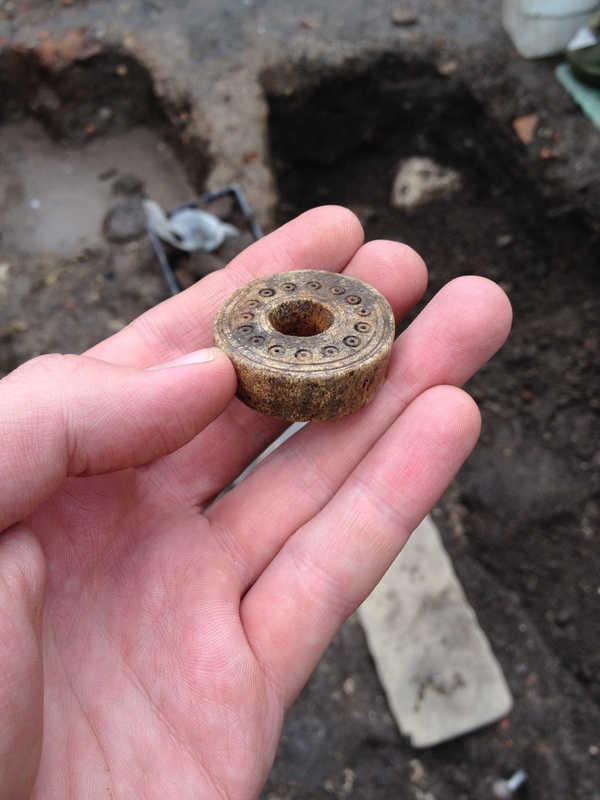 A Viking or medieval spindle whorl made of antler discovered during the 2014 season. Finding spindle whorls, pins, needles, loom weights and Virginia’s possible crochet hook gives us the chance to hold the tools that people in the past would have been all too familiar with. These crafting objects come in a variety of forms and materials; some are highly decorative while some are plain and functional. As the week progressed, Virginia continued to discover some terrific finds, including a beautiful piece of moulded Samian ware. A freshly unearthed sherd of Roman Samian ware. Disturbed from its original context by a 19th century grave digger, the pot sherd would once have been part of a cup or bowl owned by a resident of Roman York’s colonia (civilian settlement). By the week’s end, Virginia went on to make one more unexpected discovery – the reason why the northern side of the coffin had proved so hard to find! After locating the foot end of the coffin, the line of a second coffin became visible, running directly underneath the one Virginia had so carefully exposed. It was now apparent that we were looking at another grave with multiple occupants, where the coffins of relatives were placed one on top of the other within a family plot. In the years following their burial, the timber of the coffins would have decayed and eventually given way, resulting in the upper coffin collapsing down towards the lower one. It was this collapse that made the coffin so hard to define. With the mystery solved, Virginia delved deeper into the grave and revealed the remains of a young woman. Once these remains had been recorded in detail, they were once again covered over. At the northern end of the trench, Alistair began his second week on-site by completing the records of a juvenile inhumation discovered in week 11. Archaeology Live! placement Katie and Alistair recording a 19th century burial. Clear signs of disease and malnutrition had made the excavation of this burial an emotive experience and one that certainly helped to bring home the tough realities of 19th century life. With the remains recorded and re-buried, Alistair took over the excavation of a nearby burial with an unusual brick-built grave marker. Alistair recording a 19th century grave marker. This burial is the only grave so far to feature a surviving monument and it seems that whoever built the structure was not terribly concerned about their work. The un-mortared structure comprised of a stack of recycled medieval brick laid over a large limestone block which had been placed directly over the head end of the coffin. When the coffin rotted and gave way, the stonework slid down into the grave, badly damaging the skull of the individual it had been laid to commemorate. With the grave marker cleaned up, drawn and photographed, Alistair was then free to dismantle it. While excavating the remainder of the grave backfill, Alistair spotted an unusual object. Made of copper alloy, the object was hollow, with a decorative head and a ribbed shaft. While opinion in the trench remained divided, it is most likely to be some form of decorative fitting and certainly one we’ll look forward to hearing specialist feedback on. By Friday, Alistair had fully exposed the line of the coffin and the remains within. This individual proved to be a robust adult male with rather bad teeth. The records were completed, the remains were re-covered and we were able to reflect on meeting another 19th century parishioner of All Saints, North Street. Alistair recording a 19th century burial. Over at the southern end of the trench, Anne and Paul’s week got off to a similarly evocative start as they recorded and excavated the burial of an infant. Being a small and fragile feature, this called for some delicate excavation! Paul and Anne working on an infant burial. Despite dying in infancy, the individual within the burial was still furnished with a coffin and, remarkably, Anne and Paul were even able to reveal surviving timbers. Revealing a tiny coffin. The timber is visible as a lighter brown stain in the soil. After completing work on their burial, Anne and Paul’s next task took them much further back in time. Over the course of the season, structural elements associated with an 18th/19th century re-build of All Saints Rectory have been carefully recorded and removed. This process has slowly revealed an area of intact medieval archaeology that pre-dates the Rectory structure. The first deposit to deal with was a dump deposit that contained evidence of nearby domestic activity. Anne and Paul investigating a medieval dump deposit. Anne and Paul’s fine trowel work revealed a thin but distinct lense of ashy, charcoal rich material that was most likely cleared out from a domestic hearth. More evidence of medieval activity was present beneath the layer of ash and charcoal in the outline of a pit containing more burnt material and domestic waste (animal bone, pottery, etc.). Recording a medieval pit backfill. As seems to be the case with all of the best features, the pit was only just within our excavation area, but Anne and Paul were able to excavate the uppermost layer of the material infilling the pit. The deposit contained a good amount of limestone and mortar fragments, possibly relating to the demolition of a nearby building. Excavating a medieval refuse pit. Anne and Paul had made a truly intriguing discovery. We are clearly looking at relics of the day to day lives of people who inhabited the site prior to the construction of the first Rectory in the 14th century, but so far we have only found indirect evidence of this. Where were the houses these people lived in? What were they doing to make a living? As always, the best discoveries can pose as many questions as they answer – we’ll have to wait for the 2016 season to find out! Rosemin and Gus pondering a tricky deposit. The theory goes that the centre of the plot served as an entranceway into the 19th century graveyard. If this is true, there should be an absence of burials while deposits of pre-19th century date should survive. So far, a number of 19th century features had been excavated, but the 18th century horizon was proving elusive! Undeterred, Rosemin set up to excavate a sondage (a small trench within a trench) with the aim of getting a peek at the slightly deeper lying archaeology. As the week progressed, it became apparent that the archaeology was not going to reveal its secrets quite so easily. Rosemin’s patient troweling revealed a mixed dumping deposit, but early 19th century ceramics were still present and the decision was taken to halt work on the sondage until the surrounding area has been excavated to the same phase of activity. Despite this frustration, Rosemin was rewarded with a beautiful find – a fragment of a Roman drinking vessel. The pot sherd featured the clear image of the legs of an animal and is a classic example of what is known as a ‘hunt cup’. These decorative fineware drinking vessels were produced in the Nene Valley in the 2nd-3rd century and often depicted human and animal figures in scenes representing hunting. While we’ll never know which Roman citizen drank from this vessel, it adds a little more colour to a growing picture of domestic life in the colonia. With evidence of heated floors, precious metals and fine jewellery, this picture is increasingly one of leisure and luxury. Nene Valley colour-coated ‘hunt cup’ sherd. At the end of the week, Rosemin shifted her attention to a second sondage in the north-east corner of the site. This slot had already revealed a number of medieval deposits that had been truncated by a 19th century linear feature. Due to the depth of the feature the linear had not been fully excavated, but with the neighbouring deposits now removed, it was now safe to delve a little deeper. Rosemin working in her second sondage. Rosemin successfully established and recorded the base of the feature and also unearthed another surprise – two burials that pre-dated the linear. As this is a small, investigative slot, only the very head end and foot end of the burials were visible. Thankfully, enough of the burials were exposed for Rosemin to locate the coffins and remains within and, perhaps more importantly, to date the features. The form and material of the coffins and ceramic finds from the grave backfills proved the burials to be of the same date as the majority of our graves – 1826-54. This was a fantastic result, giving us a much clearer picture of the sequence at the very edge of the graveyard. Rosemin, Katie and Ellen enjoying the thrills of recording. Long time YAT finds volunteer Jean returned to site to brush up her archaeological skills and spent the week excavating a peninsular of medieval archaeology that has been highly truncated by 19th century features. Jean and Ellen discussing their latest finds. Jean unearthed a substantial number of finds, with a real range of materials. The wealth of domestic waste mixed in with brick and tile demolition rubble suggests that this deposit was laid down as a levelling dump, utilising whatever materials were to hand to raise the ground level. The site’s position close to the waterfront, in an area that has historically been very prone to flooding, suggests that it may have been laid down in response to a particularly severe inundation. Jean exposing a medieval deposit. Beneath the layer of mixed dumping, Jean began to notice a change. A layer of firmer, more clay-rich material began to emerge – we were clearly at the beginning of a complex sequence of medieval layers which will be further investigated in the 2016 season. At the far south-western corner of the trench, archaeology enthusiasts Alex and Angela enjoyed a taster course working on a medieval pit. Having travelled all the way from Utah, the pair made great progress on the feature and successfully dated it to the 14th century. Alex and Angela working on a medieval pit. The dating of the pit is significant as it pre-dates the earliest incarnation of the Rectory, proving that it was built in, or after, the 14th century. The pit also contained a large quantity of earlier material, with ceramics from the 11th-12th century appearing frequently. A particularly exciting find was the intact rim of a Norman Gritty Ware cooking pot. Alex, Angela and their star find. With the pit recorded, the week drew to a close and the realisation that our fifteenth season of Archaeology Live! had ended began to dawn on the team. It had been a vintage year! Katie, Alex and Angela recording their pit cut. The last week of a season is always memorable and week 12 this year was no exception, with a plethora of surprise discoveries emerging from the ground. The day ended in the usual way, with a wrap up of the latest discoveries taking place in beautiful sunshine. Week 12 draws to a sunny close. As ever, we must thank our marvellous team of trainees for supporting the project. Archaeology Live! receives no external funding and if it wasn’t for the hard work and dedication of our trainees, none of our fantastic discoveries would ever had been made. The 2015 season ended with a great evening in one of our favourite York bars, with the team making merry and reminiscing about a cracking season! A special mention should also go out to our amazing team of placements, without whom the project wouldn’t run quite so smoothly! Our placements often go on to careers in professional archaeology, we’re happy to say that the discipline is in safe hands. Week 12 placements Ellen, Becky and Katie. So that’s a wrap. Thanks for following the project and watch this space for updates on the 2016 season! Until next time, onwards and downwards! Autumnal clouds looming over All Saints. Week 11 of the summer excavation arrived with an unfamiliar chill in the air. The breeze now carried with it a scattering of fallen leaves and lengthening shadows now stretched across the trench. Autumn was almost upon us, as was the end of the 2015 season. With just two weeks to go, there were still so many questions to answer and the team couldn’t wait to get started! Becky, Katie and a LOT of paperwork! As the rain poured outside, the team wisely decided to focus on indoor tasks in the warmth and shelter of the church. Sessions on recording methodologies, pottery dating and finds sorting were held while the placements took the opportunity to check a small mountain of records. Thankfully, Tuesday saw the sunshine make a welcome return and the team sprung to action in the trench. The sun returns to Church Lane, well, some of it. Rosemin and Joanna took over work on an area suspected to have been a processional route into the graveyard that occupied the site between 1826 and 1854. It didn’t take long for the duo to find their first feature, as they spotted the outline of a post hole. Rosemin and Joanna investigating a 19th century deposit. Over the previous two weeks, Arran’s ‘That End’ team had been working hard to prove or disprove whether this route into the graveyard had existed. If the theory was correct, we would find no burials in this space and archaeology that pre-dates the 19th century would survive. If the theory was false, then Rosemin and Joanna would discover yet more burials. The first step in solving the mystery was to excavate the post hole and retrieve some dating material. In doing so, it didn’t take long for the week’s first exciting find to appear – a beautiful sherd of decorated Samian ware. Jo and her freshly unearthed Roman pot sherd. The post hole proved to be fairly substantial, and contained an eclectic mix of ceramics that ranged from Roman to medieval in date. The omens were good, but could this be a genuine medieval feature or were we being mis-led? After all, it is still possible to find 19th century features that contain no 19th century finds. To definitively prove our theory, we would have to investigate the deposit underlying the post hole. With the post hole recorded, Joanna and Rosemin began to clean up their area to see what deposit or feature was the next in line to investigate. This proved to be tricky work as the area was a mass of varied colours and textures with no clear cut features. By the end of the week, a number of possible features had been uncovered and, crucially, no grave cuts had as yet become apparent. Our mystery, however, remained firmly unsolved as the mixed material being revealed by Jo and Rosemin still contained early 19th century ceramics – this one was going to go right to the wire! Edges of uncertain date beginning to emerge. Over in ‘This End’, Sarah and Stuart had made a brisk start and exposed the outline of a juvenile burial. After recording the grave backfill, they began the delicate process of exposing the remains of the coffin. Stuart, Sarah and Becky investigating a 19th century infant burial. Sarah and Stuart’s diligent work was soon rewarded with an enigmatic find – a neatly cut but undecorated lead seal. Sarah and her lead seal. As the week progressed, the faint outline of a tiny timber coffin began to appear. This was clearly the burial of a very young individual, perhaps only one or two years old when they died. Infant and juvenile burials have formed a large proportion of the site’s 60-plus inhumations. This is interesting as the area was not a particularly poor place in the 19th century, indeed all of the burials were furnished with coffins complete with at least some degree of decoration. Clearly, class was no barrier to the very real trials and hardships of the 19th century and high infant mortality affected people of all walks of life. Excavating a 19th century infant burial. The remains of the infant within the coffin did indeed show evidence of these hardships, visible in a distinct curvature of both femurs (thigh bones) that can be a clear indicator of malnutrition. Sarah finishing up her burial records. Excavating features such as these can be a very touching experience, as in doing so we bear witness to the more tragic moments in the lives of York’s 19th century inhabitants. Through archaeology we can glimpse an unfiltered picture of life and, indeed, death in the past and create a permanent record of these forgotten stories. Over in That End, Alistair was finding more evidence of the tough realities of life in the 19th century. Hugh, Alistair and Katie recording a burial. Alistair’s first task of the week was to record the burial of a 19th century adolescent, yet another individual that didn’t survive to adulthood. With this task completed, Alistair took to the excavation of the neighbouring grave, which proved to be quite remarkable! Hugh (left) and Alistair (right) working on 19th century burials. As Alistair carefully excavated the backfill of the grave, he located and recorded a coffin that is quite typical for the site, a tapered timber hexagon with decorative brass panels. Timber coffins almost never survive intact, as bacteria in the soil slowly breaks down the wood and eventually causes the collapse of the coffin. At All Saints, we have been able to identify the outlines of these collapsed coffins as the decayed wood can be seen as a dark stain in the soil. Where metal fittings are present, it is common to find fragments of wood still in-situ as the corroding metal can slow the process of decay around it. Alistair excavating a 19th century burial cut through an 18th century cobbled floor. With the coffin fully exposed and recorded, Alistair began to expose the remains of the individual within and made a remarkable discovery. The person buried within the coffin died at around six or seven years of age and clearly lived a difficult life. Close inspection of the remains revealed clear ridges running horizontally across the teeth, an indication that the child had suffered from dental enamel hypoplasia. This condition can manifest itself in teeth and bone and is the result of severe illness and/or malnutrition. Once again we had found evidence of a tough life cut tragically short, but there was still more to learn. Skeletons of such young individuals are yet to develop the typical traits that help us to identify whether they were male or female, but a quirk of preservation in Alistair’s burial allowed us to hazard a guess. When the coffin gave way and collapsed onto the remains within, part of a decorative metal plate landed directly over the child’s forehead. As a result of its proximity to this corroding metalwork, some of the child’s hair was found to be perfectly preserved. This was a unique discovery for this excavation, allowing us to see that the child had had short blonde hair. This discovery could suggest that the individual would have been male, as cropped short hair certainly wasn’t the norm for young girls in the 19th century. Another intriguing possibility is that the hair may have been cropped short following a fever, a tradition which was thought to bring down temperatures. Once again, a new discovery has brought with it yet more questions, however, Alistair’s careful excavation has given us an unprecedented amount of information about a short and difficult life. As the discovery was made, the mood in the trench became understandably sombre, however, it is finds such as these that help to put skeletal remains in a very human context. Looking north-east along Church Lane. Elsewhere in That End, Hugh and Abi were also working on 19th century burials. Abi had spent the previous week establishing the true edge of her grave cut and following the outline of one side of a coffin. Finding the other side of the coffin was, however, proving rather tricky! Abi searching for the northern side of her coffin. A combination of variable preservation and the burrowing of a 19th century rabbit was making this already delicate task more difficult than usual. Abi’s patience, however, was thankfully rewarded by an interesting find, a well-preserved fragment of a glazed medieval tile that would have been part of the church floor centuries ago. Abi and her medieval glazed floor tile. Like Alistair, Hugh made some very unexpected discoveries within his burial. The grave cut was situated close to a pair of structural features that were thought to pre-date the grave; a mortared stone footing and a feature made of medieval brick. As excavation progressed, it became apparent that the brickwork was not a medieval feature after all – it was built within the cut of the burial! Hugh (below the YAT banner) working on his burial. While some burials have featured post holes at the head end that may have supported a cross, Hugh’s discovery is the first surviving example of a substantial 19th century grave marker that has been found at All Saints. Hugh exposing a 19th century brick and stone grave marker. Once fully exposed, the brickwork proved to be un-mortared and built over a block of limestone. The structure made use of recycled medieval brick and gave us evidence that the individual who built it wasn’t the most diligent undertaker. Bizarrely, the grave marker had been built directly over the top of the coffin and when this eventually collapsed, the whole structure appears to have collapsed with it, sinking deeper into the grave and crushing the skull of the individual buried within. The fact that none of our 19th century burials have been found to intercut suggests that the burials were clearly marked above ground. Hugh’s unusual sequence allows us to see what kind of monuments were in place and shows us that some 19th century individuals may not have taken a great deal of pride in their work! As well as 19th century burials, week 11 also saw the excavation of some much earlier features. Sarah, Julie, Elizabeth and Dave clearly enjoying their sieving! Julie and Elizabeth spent a two day taster session working on medieval deposits in the south-west corner of the trench. The sequence was a complex one, with an interweaving mass of dumps and pits occupying a space that was later built over by the medieval Rectory. Julie and Elizabeth planning a medieval pit backfill. Records suggest that the church acquired the land in the 14th century, and the ceramics from Julie and Elizabeth’s deposit comfortably pre-date this. In fact, the majority of the pottery was Anglo-Norman in date (11th-12th century) and were typified by the coarse gritty wares of the period. The interior of a Norman gritty ware cooking pot. These coarse, hard-wearing vessels were almost always cooking pots or storage jars. Many exhibit clear charring on the exterior and would have been used to cook countless meals almost a millennium ago. The fire-blackened exterior face of the same sherd. Clear grooves of the potter’s fingers can also be seen in the fabric. Karen and Phillip, also joining us for a two day taster, picked up work on an area they had investigated in the spring excavation. In a spur of later medieval dumping that survives between two 19th century graves, the pair found a huge range of ceramics and domestic waste. Karen and Phillip digging in the autumn sunshine. The frequent occurrence of Roman pottery mixed in with animal bone and medieval ceramics suggests that the deposit was laid down as a levelling event, raising and flattening the ground level. Clearly, a combination of primary domestic dumping and material excavated from nearby pits was utilised, which explains why so much upcast Roman material was present. Karen and Phillip sieving their medieval levelling layer. Stuart, who took part in YAT’s community excavations on the site of York’s forthcoming Community Stadium, spent two days working on a tiny island of medieval archaeology that had survived between a 19th century concrete footing and a later medieval post hole. Stuart exposing a layer of charcoal beneath a pair of stones. Despite the massive amount of later intrusions, Stuart was able to identify and record a number of contexts including a dump rich in charcoal. The post hole that cuts the deposits is thought to have been part of the original medieval Rectory, therefore Stuart’s sequence must relate to activity pre-dating the church’s acquisition of the land. Several metres away Anne, Eileen and Denis spent their week working on similar material, discovering a laminated sequence of ashy medieval deposits that also pre-date the Rectory. Anne working on a sequence of medieval deposits. A small post hole was found cutting through theses laminated deposits, complete with a pad of stone at the base of the cut. Denis and Anne’s medieval post hole. Finds were not plentiful from this sequence as disposal of material from hearth clearance appears to have been the main activity taking place at this point. Anne was, however, lucky enough to discover a fragment of a very large medieval jug. Anne and her medieval pot sherd. Week 11 also saw Toby and the finds team continuing to clean up some fascinating finds, the most enigmatic being this unusual object. This tiny bone object is actually the ossified trachea of a goose which, unsurprisingly, wasn’t the first guess of any of the trainees! A small copper alloy object was recovered from a 19th century context and may have been part of a decorative medieval(?) strap end. A tiny copper alloy fitting. All too quickly, 5pm on Friday was upon us and the team’s thoughts naturally began to turn pubwards. Week 11 saw us make some particularly solemn discoveries, with the infant burials making for a very emotive insight into the welfare of the 19th century parishioners of All Saints, North Street. Each discovery we make brings us closer to our goal of understanding how life on the site has changed over the centuries for the people who lived and worked here and how the area has developed and changed. With more burials discovered and recorded and excellent progress being made on our medieval features, the week proved to be a huge success. Thanks to all of the trainees and placements for their hard work, especially in the changeable autumn weather! The week eleven team in formation. With week 11 in the bag, we were about to enter the final week of the summer. As ever, there were a few surprises in store for us yet. There’s never a dull moment on North Street! Almost there then, onwards and downwards! Over the years, our Archaeology Live! weekend excavations have become increasingly popular and always prove to be one of the highlights of the year. The 2015 August weekend dig saw a team made up of familiar faces and one or two people making their first steps into archaeology join us at All Saints. Sharon and Julie’s weekend began in a small trench through the surface of Church Lane. Despite extensive truncation from Victorian service trenches, a small strip of intact archaeology had remained undisturbed. Sharon and Julie’s first task was to record and excavate a compacted sandy deposit that pre-dates a pair of burials from the 1700s. The darker soil is a backfilled 18th century burial, the lighter soil is an earlier surface. While it was clear that the surface was earlier than the 18th century grave, its own date could only be known once we recovered some dating material. As Sharon and Julie troweled through the deposit, the latest finds to be unearthed were 14th century in date – we had found the medieval surface of Church Lane! Finding the medieval horizon beneath present day Church Lane was an exciting but slightly frustrating development as we had reached the maximum excavation depth in this area. Despite this, the investigative slot had been successful in characterising the nature and preservation of the archaeology beneath the current paved surface. As the excavation progresses, we now know that medieval archaeology does survive in close proximity to the church and this may prove very useful in tightening up our knowledge of the dating and development of the building. With their medieval surface fully excavated, Sharon and Julie moved onto a very different challenge, a 19th century burial in the area lovingly known as ‘Contrary Corner’. Sharon and Julie excavating a 19th century burial. Despite the area’s reputation for difficult edges and unclear relationships, the pair made excellent progress. The faint edge of a decayed coffin had been partially exposed in the previous week and it was down to Sharon and Julie to expose the rest. Exposing the outline of a 19th century coffin. With the whole outline of a tapered coffin now visible, it was recorded in detail before excavation continued within it. By the end of the weekend, Julie and Sharon had even begun to uncover the remains of a juvenile individual, not bad for two day’s work! Nearby, Nicola and Michelle were facing a similar challenge as they took over the investigation of another partially excavated burial. Nicola and Michelle working on a 19th century burial. The 2015 season marked Nicola’s 12th season of Archaeology Live! and she quickly discovered an interesting artefact to mark the occasion! Nicola and her copper alloy object. The object in question was an enigmatic copper alloy fitting of somewhat uncertain date and purpose. Hopefully, cleaning in our conservation facility will shed some light on what Nicola’s mystery object actually is! Over the course of the weekend, the narrow grave cut grew ever deeper, leading us to wonder if we were ever going to find the individual within! Thankfully, persistent careful excavation paid off and by packing up time on Sunday, Nicola and Michelle had successfully revealed the outline of the coffin and the location of the skull. As the narrow grave cut had suggested, this was the burial of a small child; yet another sobering reminder of the high infant mortality of the 19th century. Elsewhere in the trench, the rest of the team were working on some very different kinds of features. Archaeology Live! legend Juliet was joined by her sister Fiona and the pair set to work on a deposit that simply wasn’t behaving itself! A small peninsula of medieval soil that survives between an 1860s drain cut and the 19th century Rectory wall had been thought to be free of later truncations, however, as it was cleaned for a photograph, Juliet and Fiona noticed that something wasn’t quite right. Ceramics from the 19th century were still present close to the wall, as was a concentration of stones and cobbles. It soon became apparent that the construction cut of the Rectory wall hadn’t been excavated to its full width, meaning Juliet and Fiona’s first task would be to excavate the remainder and amend the records of the cut. Completing the excavation of a stony construction backfill. As has been the standard for the majority of our 19th century features, the construction backfill was full of earlier artefacts, including a particularly lovely shard of post-medieval glass discovered by Fiona. Fiona and her star find! The glass is awaiting specialist assessment, but is reminiscent of decorative discs and bands applied to 17th and 18th century drinking vessels and bottles. Whether this was a prized possession of the residents of the original Rectory will never be known, but it remains an intriguing and beautiful find. Working within the footprint of the medieval Rectory, Paul, Beverley and Lynne began their weekend by recording a robber cut that appears to have been positioned to reclaim materials from the original medieval Rectory prior to the construction of its 18th-19th century replacement. Paul photographing a robber cut. With the records for the robber cut complete, the next task for the trio was to clean up the whole area to establish which deposit was next in the sequence. Stratigraphic excavation of urban archaeology requires us to excavate in reverse chronological order, so it was up to Paul, Lynne and Beverley to establish which context was deposited immediately prior to the robber cut. After a lot of careful troweling, a dark, charcoal rich deposit became the next deposit to be cleaned up and photographed. Gary, Paul, Lynne and Beverley deep in conversation while recording a medieval dump. With just enough time to start excavation before the end of the weekend, Paul, Lynne and Beverley were able to recover some dating material from the deposit – it seemed that another part of the site had finally reached the medieval horizon! At the opposite end of the trench, Paul was also descending into the Middle Ages. In this case, however, it was necessary to squeeze into a small, exploratory slot designed to find the depth of medieval deposits at the northern end of the trench. Gus and Paul discussing their sequence. With a mixed dump of clayey material recorded, John began excavation and quickly noticed an interesting change in deposition. John excavating a medieval dump. Unlike the later deposits, this context was rich with re-deposited burnt material. It is possible to identify scorched soil as it often changes colour to shades of orange, grey and red, as seen in the image below. Paul’s discovery is an interesting development as it sees a shift in activity from simple raising of the ground level through large dumps of silty clays to the kind of deposition that usually indicates occupation. In short, we are coming down on to a deposit that has the potential to tell us much more about life in the medieval period. This slot will be one to watch! The final surprise of the weekend came during finds washing. Hidden amongst countless fragments of animal bone and pottery was a previously un-noticed shard of medieval stained glass. The growing assemblage of broken medieval window glass being recovered from the site reminds us that the windows of All Saints, North Street were not always afforded the reverence they rightly receive today. It is unsettling to think of how much medieval artistry has fell foul of vandalism and accidental damage over the centuries. A shard of painted medieval window glass, complete with strokes of red paint. The August weekend turned out to be a highly enjoyable excavation, with some great finds and interesting developments. Thanks to all of the team for all their hard work and longstanding support of the Archaeology Live! project. With August drawing to a close, the final quarter of the excavation was already upon us. No rest for the wicked – onwards and downwards! The archaeology of All Saints, North Street spans from prehistory to the present day. Our third season at the site will see us excavating 19th century burials, post-medieval workshops and searching for evidence of lost medieval buildings. The 2016 excavation season will see us return to the grounds of All Saints, North Street to pick up where the 2015 season left off. The excavation will cover many periods of York’s history, from early 19th century burials, to medieval occupation deposits, as well as evidence of the city’s Viking and Roman past. From a one day taster, to an intensive four week course, there are options to suit everybody. One of the team will get right back to you with booking forms and any further info you require. This is always the big question, but in the case of our site, we do know the answer – a lot! Urban archaeology rarely fails to deliver wonderful finds and features, especially in the unparalleled layers beneath the streets of York! Over the last two seasons, the 18th and 19th century horizon has yielded evidence of an ever changing landscape that began the 1800s as a busy (and rather smelly!) light-industrial yard, before being absorbed by the church to become a burial ground in 1826. This quiet place of remembrance received the remains of parishioners old and young until 1854, when York’s churchyards were deemed full and closed. In 1860, All Saints church hall was built and was used as a Sunday school, a mortuary chapel and even a boxing club, until its demolition in 2013. Pre-dating all of this, we have discovered elements of a much altered post-medieval rectory, wall footings that could once have been a row of medieval cottages and pits and deposits relating to the site’s 12th to 14th century occupation. This season, we aim to look more closely at these features and to see what surprises are laying in wait beneath them. The walls uncovered in 2014-15 relate to an 18th century re-build of the rectory, however earlier stone footings had been incorporated into the structure. As we pick apart this building, will we find evidence of the original medieval rectory? Can we find evidence of how people were using the building and how this changed over the centuries? Looking down on the Rectory walls. We have already identified the burials of almost 70 individuals dating to the years between 1826 and 1854. In the 2016 season, we aim to locate any remaining graves to record in-situ and, if necessary, relocate to ensure they aren’t damaged by future redevelopment of the site. During this process, we hope to learn as much as we can about the people who lived through the times we are studying. The area was a busy place in the late 1700s and early 1800s. The 2016 season will see us continue to excavate these features and learn more about the industrial practices of the day. We have already found evidence of the tanning and horn-working industries that indicate the area would have been somewhat pungent two hundred years ago! What else can we find about this productive period of All Saints’ History? The site is surrounded by ancient buildings, some of which may once have stood within the excavation area. The 2014-15 season saw us beginning to uncover tantalising evidence of this, with substantial structural features appearing below 18th century industrial layers. Whether there are more walls waiting to be found, and precisely what buildings they were once part of, is something we hope to resolve in 2016. Going back even earlier, we have also begun to encounter surfaces and occupation spreads of 12th to 14th century date. As we go deeper into the medieval horizon, we hope to learn more about how the site was used during the peak of the church’s medieval splendour. Click here to learn about the medieval finds from our 2014 season. Exposing a medieval occupation layer. Nearby excavations and the site’s proximity to the River Ouse (once a major international port) mean that we have a strong chance of encountering Viking archaeology. We know there was a lot of Anglo-Scandinavian activity nearby and it would be wonderful to learn about the site’s 10th century development. A beautiful cornelian intaglio found during the 2015 season. While stratified Roman archaeology is likely to be buried below metres of later deposits, the 2014 team unearthed a wealth of Roman material. This ranged from high (and low) status pottery, evidence of luxury goods (amphorae, hypocaust tiles), well preserved coins, part of a glass ring and a beautiful intaglio stone (picture above). The site lies close to the Roman bridge across the Ouse and is located within the wealthy heart of the colonia, or civilian part of the city. While we may or may not reach the deeply buried Roman features, we are certain to find more Roman finds and learn how people were using the area at the dawn of the 1st millennium. Click here to learn more about our Roman finds. While the 2014-15 seasons focused on post-medieval to 18th-19th century archaeology, the continuous use of the site over countless centuries means that many early artefacts have been re-deposited into later layers. For example, a 19th century context dug in 2014 yielded part of a neolithic polished stone axehead! With York’s wealth of archaeology, anything is possible! Showing off a completed plan. The Archaeology Live! training excavation provides a way to learn about and participate in excavation, recording, planning, finds processing, environmental sampling, and processing. Any other specific requests for training may also be available on application. Professional field archaeologists provide all the training throughout the course. During Archaeology Live!, the archaeology will be excavated and recorded by the trainees; the trainers teach and assist when required. It is a field-based training program where people learn by doing the excavation, and by discovering and recording the archaeology themselves, rather than by classroom-based tuition. Our weekend excavations are a fantastic opportunity to experience the excitement and discovery of urban archaeology. This course offers give beginners and those with some prior experience the chance to take part in fieldwork in the heart of York. If you have more experience and want to attend, that is not a problem as we can easily gear the training towards your experience and ability. You will get the chance to excavate the site and explore archaeological techniques with the experts from York Archaeological Trust. Please email trainingdig@yorkat.co.uk to book a place. Saturday: 9.30am Induction & Introductions followed by work on site for the rest of the day until 5pm. There will be breaks in the morning and afternoon as well as a longer break for lunch (provided). In the evening there will be a meal provided for the group at 8pm. Sunday: 9.30am straight into the archaeology with similar sessions as well as working with the finds from the site. If the weather is poor in the morning we will do a tour of the local area to avoid disturbing mass inside the church. Sunday will finish at 4pm. The cost will be *TBC* per person which includes an evening meal on the Saturday. Previous Archaeology Live! trainees and FoYAT members are eligible for a reduced rate of *TBC*. All courses come with a complimentary pass for all of the Jorvik Group attractions. One and two-week courses are designed to give beginners and those with some experience the opportunity to take part in a remarkable working environment and gain an insight into the work of an archaeologist. Whether you are looking to begin a career in archaeology or have simply always wanted to try it, these courses are a fantastic way to get started. Please email trainingdig@yorkat.co.uk for any further information and one of the team will get back to you as soon as possible. A week long course runs from Monday to Friday and the working day is 9.30am until 5pm. All courses come with a complimentary pass to all of the Jorvik Group attractions. A Viking spindle whorl unearthed Summer 2014. Basic digging techniques: trowelling, mattocking, shovelling etc. Site recording: planning, levelling, section drawing and context description. Finds processing: washing, sorting and environmental sample processing. One hour seminars by specialists from York Archaeological Trust on topics such as archaeological conservation, artefacts, stratigraphy and pottery dating and recognition will take place on each day. An evening walking tour of the archaeology of York will be included, this provides an opportunity to put the archaeology you have been working on into its local and regional context. Week one of a two week course follows the same format as above, while the second week of the course is more focused on practicing and developing the skills acquired during week one. Please contact us by email if you would like to make a reservation enquiry. It is possible to do a course which is three or four weeks long, but please contact us beforehand to discuss what your training requirements are. A useful way to document your progress as you learn new skills is to download our Archaeology Live Skills Checklist. Booking forms will be provided when dates/course places have been agreed and reserved. E-mail is preferred, however, if you don’t have email access please phone (office hours Mon-Fri 9am to 3 pm). The 2015 week nine team. The cost of a week long course will be *TBC*. Please contact trainingdig@yorkat.co.uk for bookings and enquiries. * Please note that this course is open only to individuals who have participated in an Archaeology Live! excavation. We are developing a post-excavation courses for beginners – watch this space for updates. Have you ever wondered what happens after an excavation has been completed? The UK is home to many community archaeology projects and training excavations, although very few offer the chance to get involved with the work that happens between fieldwork and publication. As an educational charity, York Archaeological Trust is passionate about engaging the public in all aspects of archaeological research and these courses offer an exciting opportunity to take part in the post-excavation process. Anyone who has dug with us or followed our blog will be aware that our work creates a lot of paperwork! Single context recording breaks down complex layers of urban deposition into individual events, or contexts, that are excavated in reverse chronological order. For example, if a person living in 14th century York digs a rubbish pit in their yard, half fills it with refuse and then tops it off with clay to mask the smell, we have three contexts – a clay capping, a refuse layer and a pit cut. Each of these will be cleaned, photographed, drawn in plan, levelled, described on a context card and added to a stratigraphic matrix. These days we use a combination of hand-drawn plans, GPS/TST survey, paper records and digital records; this makes for a lot of paperwork! After the success of our previous post-excavation courses, we have refined the content to offer a more focused approach and a greater emphasis on data management and stratigraphic analysis. Digitised plans reveal a lost building. The building of a digital Harris Matrix. Analysis of the stratigraphic matrix – assignment of sets, groups and phases. An introduction to the use of software such as GIS and CAD to carry out spatial analysis and process survey data. An introduction to the use of DraftSight and Adobe Illustrator to produce publication drawings, map regressions, etc. An introduction to assessment report writing and methods of dissemination of findings. The post-excavation activities described above will form part of the final site archive, giving participants an opportunity to contribute to a professional archaeological report. The course aims to provide participants with a better understanding of the whole archaeological process and how to create a full digital archive and report from the primary data collected on-site. Record checking. A paper archive must go through ‘quality control’ before being digitised. The post-excavation courses give you the opportunity to get your name on an archaeological assessment report and experience a side of the profession that normally takes place behind closed doors. A PDF copy of the report will be sent free of charge to everyone who completes the course. HINT: A useful way to track your progress as you learn new skills is to download our Archaeology Live Skills Checklist Post Ex document. As 9.30am arrived on Monday of week nine, the new starters were welcomed on to site and hopes were high for an exciting week. After the amazing Roman and medieval finds of the previous few days, week nine had big shoes to fill. Could our lucky streak continue? There was only one way to find out! In the centre of the trench, That End supervisor Arran had a theory to test and just the men to help him do it! With two seasons of Archaeology Live! already under his belt, Atlanta, Georgia resident Bill is a proven hand with a trowel and a real history enthusiast. Joining Bill in tackling Arran’s theory was Gilbert, a microbiologist making his first foray into archaeology. With tools gathered, the pair set to work in cleaning up an area that is yet to reveal any 19th century grave cuts. With graves tightly packed at both sides of the trench, the seeming lack of any burials in this central area was not something we had been anticipating, although it may have an elegantly simple explanation. As the north doorway of the church opens directly on to this area, it is possible that this may have been a processional route into the burial ground. After all, it wouldn’t be ideal to be weaving around burials while carrying someone to their resting place. To prove, or indeed disprove, this theory, all Bill and Gilbert needed to do was find a deposit or feature that pre-dates the year 1826 – the year that the area was consecrated. If archaeology earlier than this date survives, then no graves can possibly have been placed here. Cleaning up a 19th century dump. The first deposit to be excavated was a levelling layer containing 19th century material. This was a frustrating find as it could sit either side of the year 1826, we were going to have to dig deeper to find the truth. On a brighter note, a good assemblage of finds were recovered including a stoneware bottle with a stamp that appears to read ‘bottle’. If only all finds were so clearly marked! A 19th century stoneware bottle sherd. As well as 19th century finds, some significantly earlier material was also cropping up. Gilbert’s first ever dig was marked with a rather special find, a neatly struck silver coin that appears to be medieval in date. Not bad for a first-timer! Gilbert displaying his freshly unearthed medieval coin. With the surface corrosion cleaned away by our team of conservators, we will hopefully be able to identify precisely when and where this coin was minted. As excavation continued, Bill and Gilbert began to notice a change. Beneath their rubble-rich levelling layer a cleaner deposit was emerging, as was the clear outline of a small cut feature. It seemed that a new post hole had been discovered. Bill and Gilbert following the edge of a cut feature. Once fully recorded, the feature was ready to excavate and it didn’t take long for us to quite literally smell a rat! The edges of the feature ran diagonally down beneath the surface as opposed to straight down – it was a 19th century rodent burrow! Just a few metres away, returnees Celia from North Yorkshire and Anne from Brisbane spent their week on some very delicate archaeology indeed – the burial of a 19th century infant. There is only one way to approach the excavation of such features and that is with extreme caution. Not only is it crucial to treat the remains with the appropriate amount of care and respect, it is also vital to avoid causing any damage to the fragile bone and coffin remains. Becky guiding Anne and Celia through the delicate excavation process. Almost all of the infant burials encountered thus far have been interred within a timber coffin. After a century and a half in the ground, these generally survive only as a dark, organic stain, punctuated at regular intervals by the corroded remnants of iron fittings. A quirk of chemistry means that the decay of wood is slowed by proximity to metalwork, as such, it is possible to identify fragments of wood that still survive around the iron brackets and decorative brass plates of the coffins. Recording the remains within the grave cut. With careful excavation, the size, shape and materials used in our coffins can be revealed. After completing this task, Anne and Celia began to carefully expose the skeleton within the coffin. It quickly became apparent that the remains had been heavily disturbed by root damage and animal burrowing and, as the burial was very shallow, it was necessary to lift the skeleton to protect it from any further erosion. The burial will be housed temporarily within the crypt of the church and will be re-interred when the ground levels on-site have been reduced, this will safeguard the remains from future re-development. The high proportion of infant and juvenile burials provide us with a sobering reminder of the grim realities of life in the 19th century. In a time when modern medicine was in its infancy and living conditions were harsh for many, infant mortality was simply part of daily life. In this instance, Anne and Celia’s careful work has allowed us to witness a very personal moment of loss and reminds us that it is the lives people just like ourselves that we are investigating. At the southern extreme of the trench, Scott and Sam joined us from the USA and Germany respectively to further investigate the sequence of deposits beneath the recently lifted 18th century floor of the Rectory. Scott and Sam set to work on a post-medieval dump. Working in the shadow of the 19th century walls of All Saints Church Hall, Scott and Sam excavated a large make-up deposit that may have formed the base of a post-medieval floor surface pre-dating the later brickwork. Finds were in no short supply, as the deposit yielded eight tubs of ceramic building material and domestic waste! Scott, Thomas and Sam hard at work. Later in the week, Scott and Sam were joined by taster student Thomas, who helped them lift the last of the deposit. As each bucket of material was taken away, an earlier sequence was slowly being revealed. It seems that a sequence of pits were present in the area prior to the Rectory. This is an interesting discovery as pits are not features that you would expect to find inside a building – could we be looking at a different use of the area that pre-dates the original medieval Rectory? Scant documentary records suggest that the church acquired the land in the 14th century, it will be interesting to see if the dating material within these pits follows this pattern. Scott, Sam and Thomas had a great week on-site, successfully taking the area back in time from the post-medieval to the medieval period. Archaeology Live! legend Bri began his second stint of the summer by finishing the recording of a post-hole associated with the original medieval Rectory before moving on to a medieval levelling deposit. Bri recording a medieval deposit cut by later brickwork. Cut by numerous later walls and service trenches, Bri’s medieval deposit may provide us with an insight into what was happening on site before the medieval Rectory was built. As it turned out, however, Bri’s most exciting find was even earlier – the rim of a shell-tempered pot from the Viking period. The inclusions of crushed shell were used as a temper, which allowed the pottery to be fired with a reduced risk of cracking in the kiln. Over the 2015 season, we have found an increasing amount of Anglo-Scandinavian ceramics re-deposited in later contexts. It seems highly likely that there was considerable Viking activity in the area, which isn’t entirely surprising given the site’s waterfront location. Excavating an island of medieval archaeology surviving between later walls. 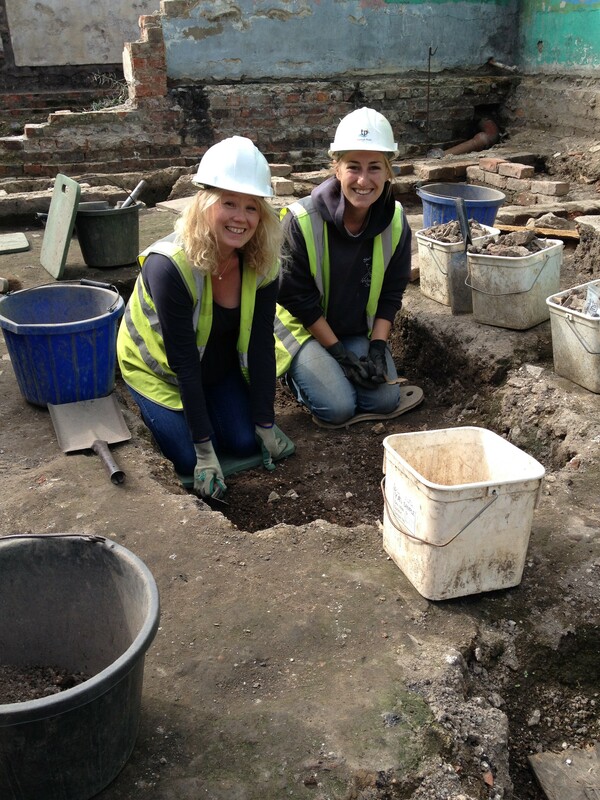 Later in the week, Bri was joined by Julia and the pair made good progress on their medieval deposit. Julia was lucky enough to find a beautiful base sherd from a post-medieval jug complete with fingerprint decoration from a later intrusion into the medieval horizon. Julia and her post-medieval pot sherd. Over in Arran’s area, Beverley and Margaret’s week was spent working on a tricky sequence around two slowly emerging structures. A small section of medieval brickwork and a fragment of a mortared stone wall have been slowly emerging as later deposits have been taken away. We cannot yet investigate these enigmatic structures until all later archaeology in the area has been dealt with, so Beverley and Margaret had a lot of work to do! Convincing edges have proved hard to come by in this area, but Beverley and Margaret’s careful troweling soon paid dividends as clear edges finally began to emerge. While the surrounding area has been densely packed with 19th century burials, they were conspicuous in their absence in this space. As Margaret took away the last of a 19th century trample layer, however, a patch of yellow-brown sand was clearly cut on both sides by later features – we had found not one but two new graves. Margaret exposing two grave backfills either side of the lighter sand. Margaret and Beverley wasted no time in recording the first of these deposits and were quickly ready to begin excavation. The grave backfill proved to be full of fascinating material and Beverley and Margaret quickly amassed an impressive range of Roman and medieval ceramics as well as 19th century material contemporaneous with the grave. Margaret and Beverley show off their medieval and Roman finds. Over the wall in Contrary Corner, Charlie spent his two day taster course following the edge of a partially exposed coffin. Despite only having a few days of archaeological experience, he proved to be a careful and accurate troweller. Charlie exposing a 19th century coffin in Contrary Corner. Close-by, taster student Maddy picked up work in a small slot into the medieval horizon. As the image below reveals, the ground level has changed significantly between the 14th and 21st century! Ellen sitting on the 21st century ground level, while Maddy descends into the 14th century. Calypso and Andrew’s taster day fell on the week’s only rainy day, but this didn’t deter them from getting stuck in! The father daughter duo worked on a 19th century trample layer in the central area of the trench. Calypso and Andrew braving the rain. Toby’s finds team continued to produce some cracking finds over the course of the week, including a piece of possibly Roman jet. While the object has not been carved, it may be an off-cut related to jet working. A fragment of Whitby jet. A pair of broken and healed bones from the tail of a cat or small dog provided an insight into the misfortune of a 19th century pet. Evidence of a poorly kitty? Finally, a pot sherd was cleaned up that may be part of a medieval chafing dish. It seems wining and dining may have been a local concern in the Middle Ages! A medieval chafing dish sherd? Week nine turned out to be another week of great finds, new features and tricky questions. Thanks to all of the team for their sterling work and excellent company! So, that sees us three quarters of the way through the season. We’ve already achieved an incredible amount, but as ever. there are always more questions to answer. Let’s see what the home stretch has in store for us!